"The American Reinvestment and Recovery Act provides more than $26 million for two Pennsylvania rail projects — $25.6 million will be used to eliminate three rail-highway level crossings on the line between Philadelphia and Harrisburg, and the remaining $750,000 will be used for a feasibility study to determine the improvements needed to extend high-speed passenger service from Harrisburg to Pittsburgh. A better use of the money would be to lay out a more direct route through central Pennsylvania, rather than use the existing route, and second to make New York City, rather than Philadelphia, the starting point." The U.S. government is awarding money to study and finance high-speed rail projects. That money should be directed to the most heavily traveled routes. More than twice as many people reside in New York City than live in Philadelphia, and the population density is greater in the former than in the Philadelphia area. To be successful, high-speed rail should go where most of the people are. New York City is the largest city in the United States, while Philadelphia is only the fifth largest. Additionally, New York City has better connectivity to surrounding cities with its commuter rail systems, buses and highways than Philadelphia and more people travel by air or auto between New York and Pittsburgh than they do between Philadelphia and Pittsburgh. The Pennsylvania Railroad from Philadelphia to Pittsburgh followed the mule paths of the former canal system and thus meanders along rivers and stream beds. This is the route that $750,000 is to be spent for a study to determine the improvements necessary to make the route suitable for high-speed rail. It has long been recognized that a more direct route through central Pennsylvania is needed. 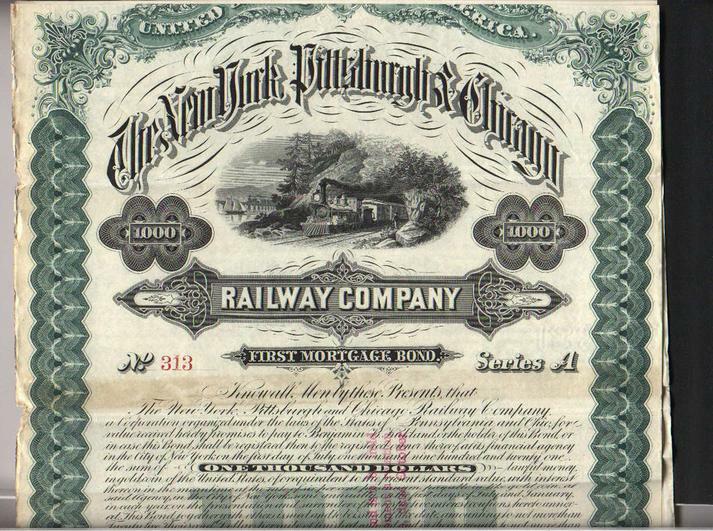 A number of proposals were offered through the years, but the most targetable was the proposed construction of the New York, Pittsburgh and Chicago Railroad in 1907. Approval was granted for construction, but the economic panic of 1907 and the start of World War I made financing the project doubtful. A critical aspect of the NYP & CRR proposal was to head directly west from New York, rather than go 91 miles south to Philadelphia (branch lines would connect Philadelphia and Pittsburgh to the main line). It would have straightened the route by tunneling mountains and bridging streams, thereby reducing the circuitry and curvature of the existing route. On leaving New York, the railroad would have gone directly west through New Jersey, entering Pennsylvania in the Easton area. Going west from there the route would have passed through Pottsville, crossed the Susquehanna River at Herndon, up the Penns Creek valley to Boalsburg. A seven-mile tunnel was to be constructed through the Bald Eagle Mountain at Dix Station. Continuing west, the route would have passed though Irvona, Indiana and exit Pennsylvania in the New Castle area. The proposed NYP & CRR would have been a truly high-speed railroad with grades of less than two-tenths of one percent and curvature of less than two degrees. The mileage of the existing route between New York and Chicago would be reduced from 924 miles to 780. The mileage of the existing route between New York and Pittsburgh would be reduced from 444 miles to 355 miles. This reduction was achieved by eliminating direct service to Philadelphia and by straightening the railroad through central Pennsylvania. Even with maximum speed of only 110 mph, travel time from New York to Chicago could be reduced from the existing 19 hours to less than 12 hours, and the time between New York and Pittsburgh could be reduced from 9 hours to less than 5 hours." "Rail passenger travel would become an attractive alternative to flying because of the reduction in travel time between cities. In addition, it would be attractive for freight express shipments by providing overnight delivery between major cities. If there is to be high-speed rail in Pennsylvania, the first attempt must be a success, particularly if public money is to be used in financing the project. A better use of the $750,000 would be to study the feasibility of a new, more direct high-speed rail connection between New York and Chicago. The old adage about trying to make a silk purse out of a sow’s ear certainly applies in this instance. Trying to massage the existing route into a high-speed rail route is trying to do just that. It just can’t be done." In the opinion of a former Director of the National Association of Rail Passengers (NARP), the railroad that was almost built in 1907 should be built now - for high speed rail. He states: "To be successful, high-speed rail should go where most of the people are." "The proposed NYP & CRR would have been a truly high-speed railroad with grades of less than two-tenths of one percent and curvature of less than two degrees." In a concise and fantastic Op-Ed, former NARP Director, Larry Joyce, discusses the New York, Pittsburgh & Chicago Railroad that was almost built in 1907. "The proposed NYP & CRR would have been a truly high-speed railroad with grades of less than two-tenths of one percent and curvature of less than two degrees. The mileage of the existing route between New York and Chicago would be reduced from 924 miles to 780.